Is It Time To Stop Calling Exercises “Good” Or “Bad” « Burn The Fat Blog – Tom Venuto. Did a trainer ever tell you that upright rows are “bad” for your shoulder joints? Did you ever see an article listing “dangerous exercises you should never do?” Have you heard leg extensions are not only “bad” but not even effective? Did a lifter ever tell you deadlifts are a “good” exercise? What if they are all wrong? Read on and decide for yourself. The author made some convincing points about why we should ditch the labels “good” and “bad” when describing exercises. He suggested that we should never judge or classify any exercise without a context. A good or bad exercise for whom, when and how? Instead we should consider the individual and their situation, and rather than make a good or bad judgement, we should make a risk to benefit judgement. On that basis, coaches and fitness professionals should never dictate exercise choices, they should steer clients to what is best for their goals and offer modifications and alternatives when needed. From the client’s perspective I would look at this as, never let yourself be dictated to by an “expert.” Or as motivational speaker Jim Rohn used say, “Take advice, not orders.” You should seek the truth based on evidence, not opinion, and choose the best exercises based on your personal situation. One reason this editorial jumped out at me is because this subject had already been on my mind a lot lately. I recently published numerous features for our members about so-called bad exercises that are actually not so bad after all, when you look at them in context. Crunches: Do they destroy your discs? Leg Extensions: Bad for your knees and ineffective? Leg Press: Non-functional “bad” exercise? Upright Row: Shoulder wrecker or most underrated deltoid exercise? The leg extension has been called a “bad” exercise by many lifters and even worse, by personal trainers who influence a large number of clients and followers. They claim the exercise is bad for the knees and it’s not an effective exercise anyway. The truth is the leg extension poses some risk to the knee joint, especially people with pre-existing ACL problems. However, for people with healthy knees, the risk of knee injury is minimal or virtually non-existent. In addition, the leg extension, while it is not meant to replace multi-joint exercises like squats, is a superb addition to bodybuilding and hypertrophy programs. Crunches and low back pain? The crunch has also been vilified. Based on what looked like expert opinion and scientific evidence, people were warned that crunches were a bad exercise that could lead to herniation in the lumbar discs. The truth is, in animal studies, disc herniation occurred when thousands of cycles of spinal flexion were performed (dead pig spines were used, as it is unethical to design a study on humans to see how much stress it takes before disc injury occurs). But the risk is very low when crunches are done by healthy humans with no existing low back injury and performed with a reasonable volume (doing thousands or even hundreds of repetitions of crunches is never reasonable or necessary). As an anecdotal example, I herniated a disc, possibly related to heavy squatting (a “good” exercise), when i was only 20. In the 29 years since, I have done crunches religiously and never had a low back injury or re-injury I could trace to performing crunches, and I was never hurt while performing a set of crunches. Well, what about behind the neck exercises? Totally bad, aren’t they? We could extend these same arguments to other exercises that are frequently called bad, such as upright rows, pulldowns behind the neck or press behind the neck. These exercises perhaps have more solid evidence suggesting a higher risk potential, but even here it depends on context: Does a trainee have existing shoulder or rotator cuff injury or impingement? if so, the exercise may be considered high risk or even contraindicated. But if someone has no shoulder injury and observes minor modifications in form, such as upright rowing only until arms are parallel to the ground, the risk is much lower. Upright rows therefore are not a good, nor are they a bad exercise, they simply pose higher risks for some people than others. (If you can do the modified upright row safely, it’s an awesome shoulder width builder). I’ll use myself as an anecdotal example again. The deadlift is today more popular than ever before, even among bodybuilders and recreational exercisers. It’s widely considered even more than a “good” exercise, it’s praised as one of the best. Well, the best for whom? My L4 disc rupture is a very old injury, but I believe I still have a higher risk of low back strain to this day than people who have never had a low back injury. I have done deadlifts many times and could often work up to 315 to 365. But every time I (my ego) chased after certain strength “standards” or getting a certain number of plates on the bar, I got injured. The deadlift is an inherently risky exercise for certain people with low back injuries. Does that mean I should call it a “bad” exercise? No. I shouldn’t even call it a bad exercise for me. I call it a “high risk” exercise for me, and when I do them, I am hoping to gain some benefit, but I know there’s a significant risk. I can reduce the risk by doing the exercise with perfect form, with less weight, more reps, never near failure, and never 1 rep maximums. Or, I can take a pass on deadlifts and choose different exercises for the back that are less risky. It’s not only about injury risk or danger, it’s also about effectiveness. Multi-Joint barbell and free weight exercises are widely considered good, while isolation exercises and machines are called bad. This is yet another false dichotomy (that could fill a whole blog post). Last but not least, there is the huge question of technique. How is the exercise performed? With perfect form or loose (cheating) form? And if the exercise can be modified for special populations, is that being done properly? 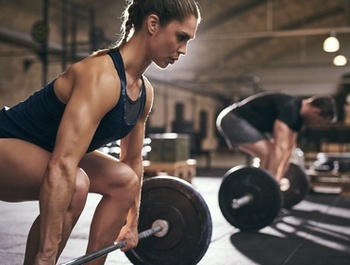 In the gym, in books or magazines, online, and even among fitness professionals and trainers who may be coaching you right now, there’s a good chance you will keep hearing the words “good” or “bad” to describe exercises. Even worse, you’ll observe fear mongering. On the internet, you can count on it because titles like “The 7 dangerous exercises you must stop doing right now” are “click bait” – they get attention because fear sells better than science, common sense and logic. Some trainers with blogs may keep doing this just for the clicks, especially when they have exercise programs to promote. Other trainers do believe sincerely that certain exercises are bad across the board. P.S. To learn more, join us at Burn the Fat Inner Circle, where you’ll have science-based exercise instruction and effective muscle-building workout programs at your fingertips, a mouse click away, every day. Learn more at: Burn The Fat Inner Circle. Reference: Morey J Kolber, Should We Classify Exercises as Good Versus Bad? Strength and Conditioning Journal, Volume 39 Number 5. I think you’re absolutely right – we generally can’t call exercise “bad” or ‘good” but rather have to ascribe a risk percentage to it, depending on the person’s condition and level of preparedness. However, I would still call good mornings 95% risky for everyone. I used to work as a neurologist in another country, and neurosurgeons who operated on discs, would always say, “if you need to lift anything heavy, bend your knees, not your back – keep it upright as much as you can.” Statistically, I saw the most of lumber disc hernias and protrusions after good mornings. So, I would say it’s pretty high percentage of risk for both novices and experienced bodybuilders. But for the people who don’t understand abstracts like percentage (and many people don’t) I would still suggest this exercise is not so good. I mean, I wouldn’t be afraid to take a responsibility for that. Same goes for straight leg deadlift from a platform. For my older dad, though, who is recovering from heart surgery, lost a lot of muscle mass, and who mostly prefer treadmill, and then just go straight to bicep curls, I would say, “you need to squat and it’s good for you.” And no, it’s not best to have a beer after. So, you’re right, it all depends, but so does our choice of words and level of responsibility in a given situation. Awesome post. Thank you for not swinging that pendulum too far in one direction. N=1 when dealing with clients and patients.